Aperture sets how wide the lens opening is when you take a picture. The wider it opens, the more light it lets in. Also, the wider it opens up the more blurry the background and foreground of your image. When you are setting the number on your camera, the lower the number, the wider it opens. I just try to remember that aperture is the one that is backward. The lower the number, the more light in and the more blurred the background is. Does that make sense? Grab your camera and figure out how to set it to aperture priority mode. (on the canon rebel, you set it to AV, and you can raise or lower the aperture by turning the dial on the top left of your camera to the right or left. Incidentally, in order to go to the lowest available aperture on your lens, you need to have it zoomed all the way out. I think most lenses that come with the canon rebel these days have a 3.5 lens, which means the lowest available aperture to you is 3.5, in order to dial it down that far, your lens must be zoomed all the way out.) It’s a good thing to keep in mind when buying a lens because you may want to be zooming in a lot, but the fact is you may have to be used to just getting closer to things rather than zooming if you need a wide aperture. 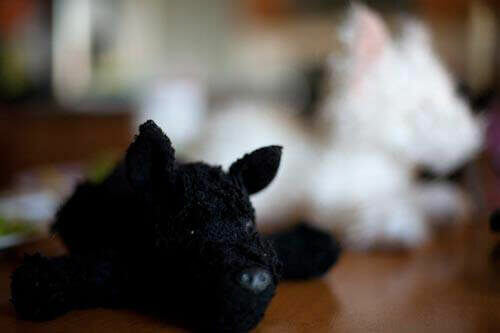 Find two objects, place one in the foreground, the other in the back and slightly to the side so it is visible. (make sure that wherever you are shooting has plenty of light!) Adjust your aperture so that it is at the lowest possible number. Focusing on the object in the foreground, take the picture. Now, raise up your aperture. If you started at 3.5, go up to 4.5. Again focusing on the object in the foreground, take a second picture. Raise your aperture up a third time, this time to maybe 5.6 and take a third picture. Now you can compare them to each other. The background object on the first photo should be the most blurry, and slowly become sharper in the subsequent photos. 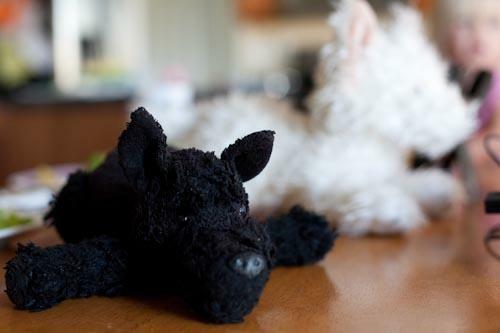 In these samples, I photographed my daughters dog Black Puppy,with the less beloved White Puppy in the background. This first photo I shot at a 1.4 aperture. The second photo I shot at 3.2. Notice how the background is becoming slightly less blurred. This final photo I took at 5.6 and you can see a clear difference between it and the first photo. With each adjustment to the aperture setting, the shutter opens less and less wide, letting less and less light in, which changes the depth of field, or how blurry the background is. In aperture priority mode the camera will choose a slower shutter speed to compensate for lack of light. If the camera allows you to see the information on each shot, make note of the shutter speeds and how they change in comparison with how the aperture changes. When I adjusted my aperture, the higher the numbers the darker my picture became. It did not blur. What did I do wrong? The lower numbers will actually give you more light like 3.5, 22 will give you less light because these numbers actually represent the base of a fraction expressing how open the aperture is. I am trying to learn about the lighting used on my backdrops including the use of the umbrellas. I have three umbrellas and need to learn more. Is there a section in this free course that teaches it? I was doing this exercise using my Canon Rebel T1i. The lowest apeture my camera would allow was 5.6. What do I need to do to lower the apeture to 1.4 and 3.2? I zoomed the lens out. What lens did you use for your first picture. The lowest aperture my lens has is 3. I’d like to know what type of lens to buy because I really like how these photos turn out. Thanks in advance. To get those most open aperture settings you have to have the lens tucked in as much as possible. If you were already zoomed out then you’d have to find a lens that goes down to 1.4. The lens that comes on the t1i will only go as low as open as 3.2, but you can still practice this with different settings, just not as low as you could with a better lens. Here’s an example of a 1.4 lens. As you can see it doesn’t zoom, but it should be clarified that when you do this exercise you should zoom, but keep all the same settings except for the aperture. Hope all this helps! now I have to buy 50mm lens! I have a nikon d3100 my lowest aperture setting (f setting) only goes to 3.5….is that bad for taking pictures that my camera doesnt go to 1.4? 3.5 is pretty standard. You buy a lens that goes down to 1.4 but many fantastic photographs are taken @ f3.5 and above. I have a nikon d5000. I know it’s not the most professional of cameras, but I would like to get a better lens because I love taking portraits. All I have right now is the 18-55mm with a lowest aperture of 3.5. What lens would you recommend??? Great lesson thanks! Question, do you like cannons better then the nikons? If it was between the Nikon d3100 or the cannon rebel eos t3 which one would you get? Hi, thanks a lot for all the information on this site. Is the aperture adjustment by zoom-in and -out on lenses and the aperture adjustment directly in camera-aperture priority, are different or same. If they are different, which one should one prtfer. You mentioned to play around with the aperture and watch how your camera adjusts the shutter speed. When I adjust the aperture in AV mode on my Canon 5D Mark iii, the camera was mainly adjusting the iso. The shutter speed stayed between 1/60 and 1/80 whether I was shooting at f2.8 or f8.0 or even f12. Was I supposed to be observing greater changes than that? Amazing lesson. I have a question, I own a Canon EOS 60D and my lowest aperture is F3.5 and it when I take the picture is pretty normal, and when I raise it up to 5.5 or higher the image comes more blury, I’m a bit confused. What should I do? or what am I doing wrong? P.S. I am using a regular 18-135mm lens. Does that have anything to do with it? thank you! As I was doing the Aperture My pictures were dark and red and I didnt see much difference from the first to the last pics.what did I do wrong? I tried this exercise using my Panasonic Lumix point & shoot. I followed the instructions, including making sure there was plenty of light. I used auto flash and no flash. I did not get any blur for the subject in the foreground. I also am having trouble with aperture outdoors. Lower f-number and slower shutter-speed are giving me wash out from too much sunlight all the time. What do I need to do? What am I missing? Thank you. I also tried it with a Panasonic Lumix Fz70 but I couldn’t get any blurriness even with the lower f that is 2.8. What did I do wrong? Here is the link to the User Manual for the Canon EOS Rebel T5i http://gdlp01.c-wss.com/gds/5/0300010905/02/eos-rebelt5i-700d-im2-en.pdf It’s on page 112. Canon calls it AV (for Aperture Value). Can you people post stuff for smartphones also or do the same also apply to smart phones?? I have a Sony Cybershot DSC-H300, Any suggestions on ISO, aperture and shutter speed settings for shooting bald eagles on the fly and when sitting still? I’m trying, to, with my Lumix fz70, as well. No blurriness at all.